Building on two awards in 2016, Teknion Corporation today announced that three of its workplace furniture products – the Expansion Cityline furniture system, Altos Landscape wall collection and height-adjustable desk, and Nuova Contessa task chair – have been recognized with 2017 Good Design Awards. The annual international competition is presented by The Chicago Athenaeum, together with The European Centre for Architecture, Art, Design and Urban Studies. The Expansion Cityline furniture system is based on the concept of planning for a workplace as vibrant and dynamic as a modern city. With a unique beam framework and robust accessories program, Expansion Cityline creates workstations, collaborative spaces and mixed-use areas where people feel comfortable and empowered as they pursue individual and collective goals. Expansion Cityline offers a highly active setting that allows people to move, to gather and to disperse when privacy and focus is desired. Expansion Cityline. Image via Teknion. Altos Landscape is a wall collection that is horizontally planned with a functional collection of wall-integrated furniture. This unique combination gives opportunity for layered off-module planning applications that maximize the usable space in an environment, and minimize the necessary cost of architectural product on the floorplate. The collection includes both height-adjustable and fixed-height desks, a task light, storage options, a shelving program and significantly enhanced acoustic fascia program with both soft and hard fascia materials. Teknion Altos Landscape, storefront with Altos desks. Image via Teknion. 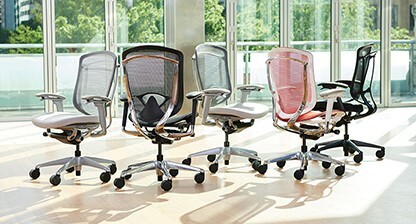 Nuova Contessa is a redesigned and enhanced version of Teknion’s popular Contessa synchro-tilt task chair. It honors the beautiful signature, sweeping line of Contessa’s structural frame, while offering significantly upgraded seating functions and increased strength. The chair has been redesigned to meet current demands for uncompromised seating comfort for diverse body types. Dedicated to innovative and sustainable design, Teknion provides a diverse portfolio of office furnishings, seating, ergonomic accessories and architectural products. The company’s versatile and integrated furniture collections support workplace wellness, responding to essential human needs and behaviours.